The latest Kickstarter campaign from Levitat is a comprehensive product made to challenge the most dedicated student of yoga — and to provide a hanging space for family fun. The triangular aerial mat is designed to be suspended between three points, serving equally as a giant trampoline, training ground, or resting place. 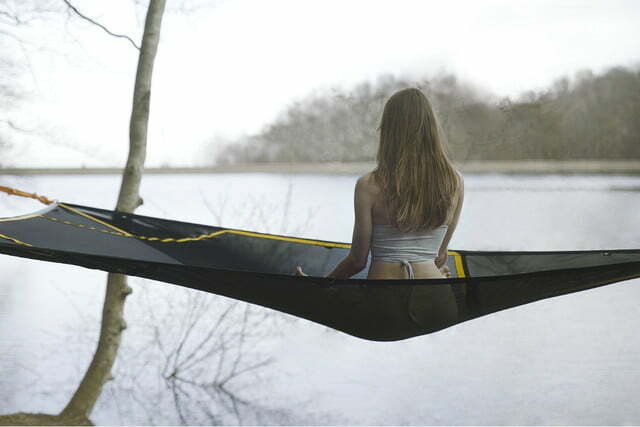 The Levitat is a contemporary twist on the traditional hammock, offering a dynamic way to experience the outdoors (or indoors, if you’re so inclined). The product is fashioned to be suspended between three trees, points, walls, or within the frame accessory that enables it to be free-standing. Brightly colored security straps stretch from the mounting points to reinforced t-straps that surround the hexagonal interior. The fabric itself is crafted from reinforced layered mesh, capable of holding up to 770 pounds. It is meant to comfortably rest three adults or six small children. Structural strips are made from high resistance nylon and are easy to utilize as the product’s own version of slacklining. Levitat was engineered to provide a way to increase core strength, maximize your awareness, and optimize the way you exercise. The product boasts large capacity while maintaining a small transport size, easily rolling up into a small, compact backpack that you can take with you anywhere. 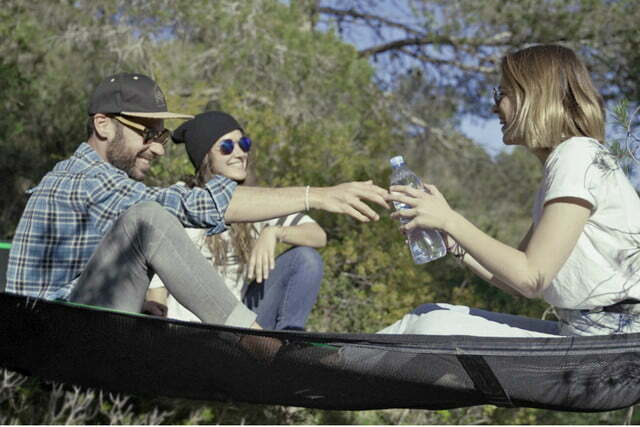 The hammock requires a minimum set-up area of 65 square feet. The backpack measures 16.5 by 7.8 inches, making for an extremely packable product. Levitat serves as the only “yoga hammock” on the marketplace — providing an inviting and challenging space in which to practice your poses. The company claims the aerial mat improves blood circulation, awareness, concentration, and core strength, while adding an additional balance challenge element to any workout. The Levitat is available in a variety of colors including purple, yellow, and blue. While the Kickstarter campaign has reached its pledge goal, you can continue to back the product. An early bird pledge of $160 guarantees you one Levitat mat after production begins.